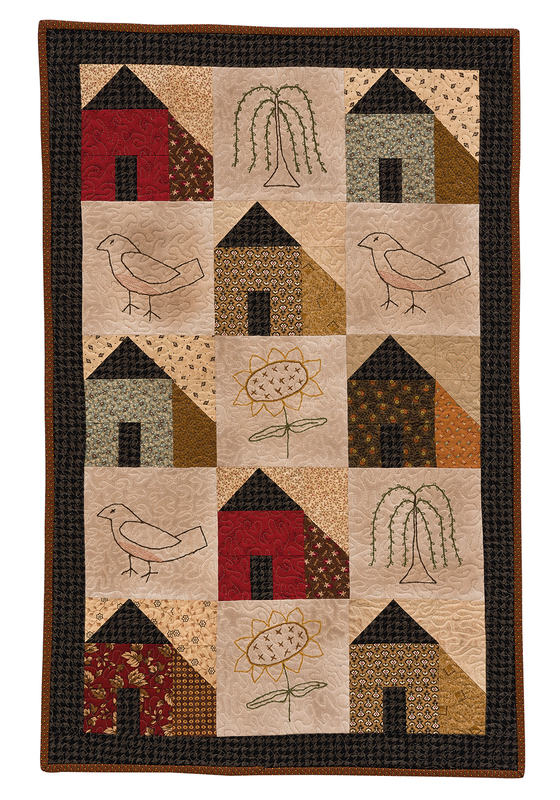 This is the first quilt I designed with house blocks: Country Road. I have not yet written the pattern but will do it soon. This simple quilt - only the roof eaves change from house to house - uses precuts from Fat Quarter Shop: they are called Jolly Bars and measure 5" x 10". I love the size of these precuts because I can make quilts very quickly with them. Click here for a pattern for a very quick quilt featuring Jolly Bars. Each block measures 13-3/4" by 8-3/4". There are some duplicates in the packet which I used to make the houses. The single ones were left for the roof. The yellow windows were perfect to show them all lit up! The eaves were fused and machine appliqued to the blocks, showcasing contrasting fabrics and fun shapes. Leftovers were used to make four-patches for the borders. I backed the quilt with flannel, so it is doubly cozy: it has house blocks and a soft backing! I quilted the sandwich with organic lines on the rooves, and stippling everywhere else. House blocks are the craze right now. You know I have been making house blocks for another quilt and hope to put them together soon. 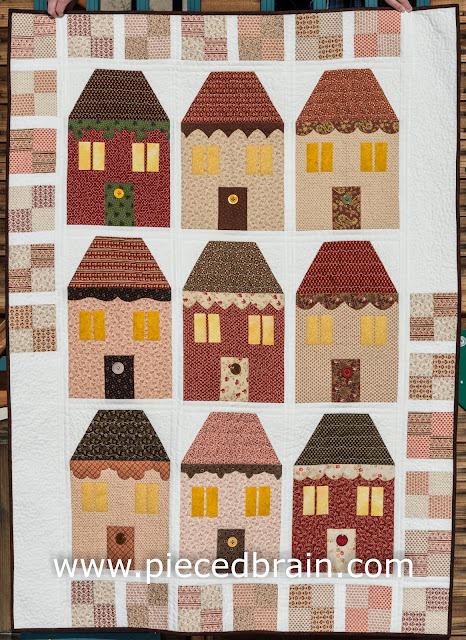 In the meantime, I have just received a book for review from Martingale with lots of beautiful house blocks and quilt layouts reminiscent of neighborhoods in small towns, country lanes, and large cities. Check it out! Karen Burns from Martingale selected 14 designs by creative quilt designers to include in Block Buster Quilts: I Love House Blocks, each coming up with strikingly different versions of blocks and layouts for house blocks. In the House Blocks 101 section, we learn how to construct a flying-geese, a trapezoid, and an equilateral roof. Then, our eyes feast on the amazing quilts! 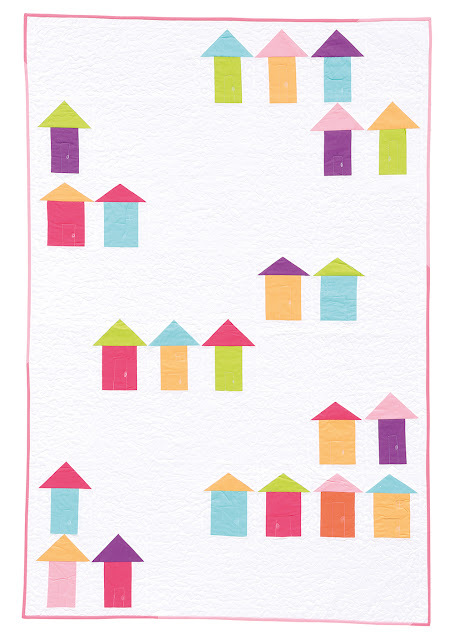 Sherbert Town, by Corey Yoder, has borders around each house block forming an Irish Chain effect. ... and so does Village on a Hill by Jackie White! Cheerful solid fabrics and an asymmetrical layout create a charming, modern design. 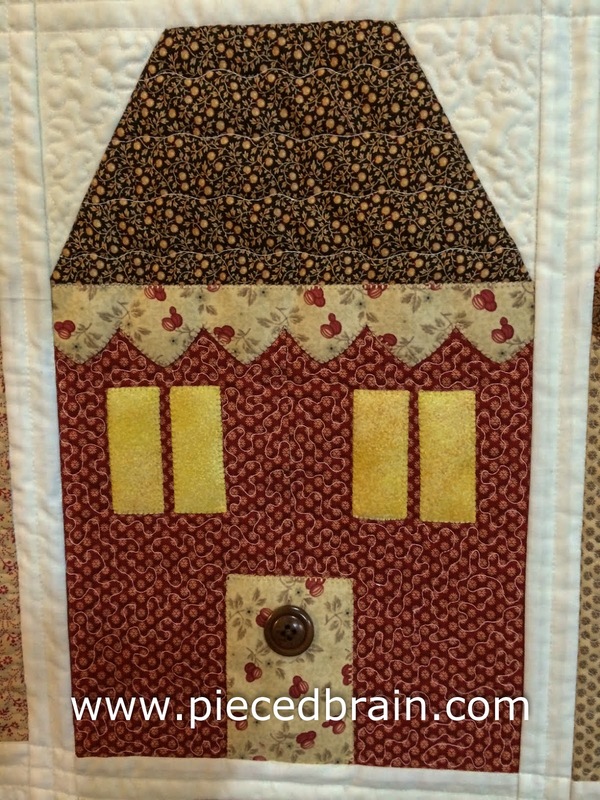 This is Little Country Home by Jeni Gaston. The perfect choice of embroidery motifs complements her fabric selections to lend a primitive look to the quilt. 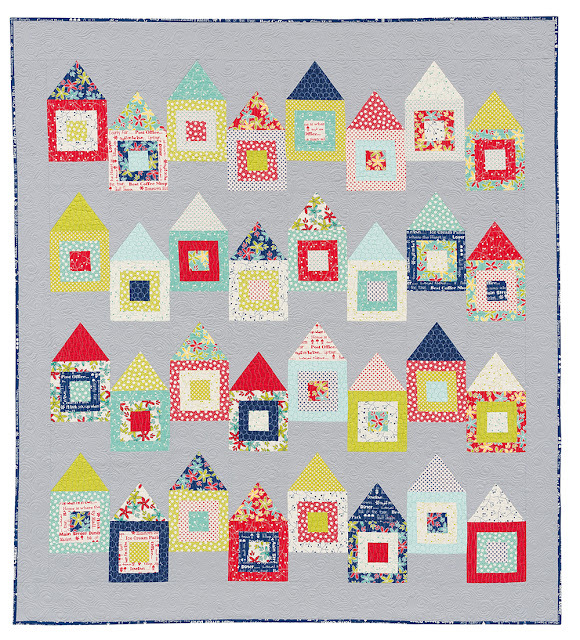 With lots of diagrams and clear instructions, I would not have any trouble constructing the blocks and assembling the quilts. 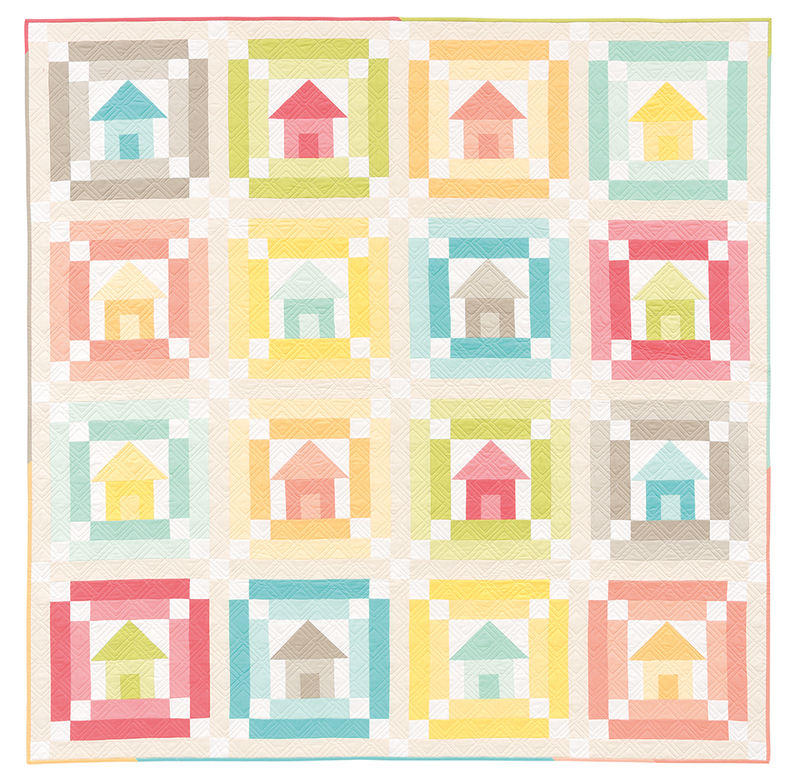 I could even combine blocks from various quilts to make my own design. 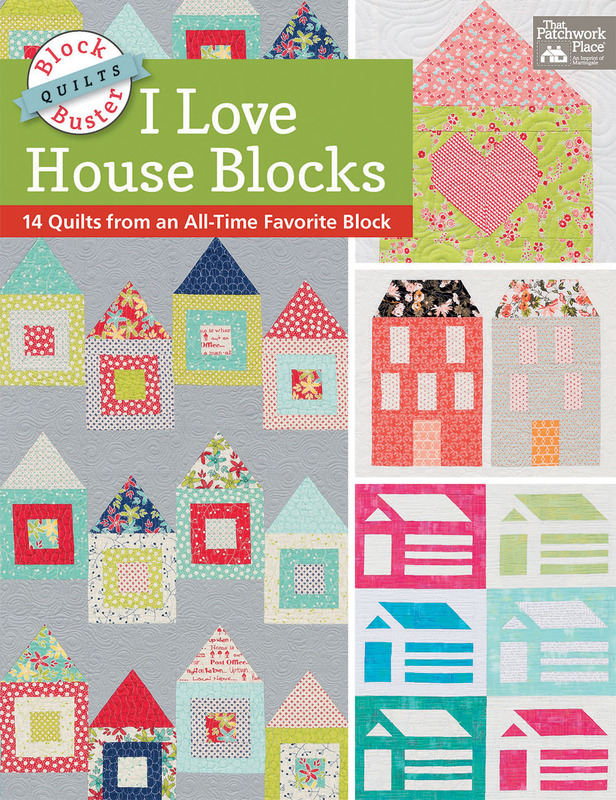 Hmmm... Block Buster Quilts: I Love House Blocks has also given me ideas for a layout for my Dwell Quilt. Can't wait to put it together!